I saw these marbles a few months ago at Pier 1 and loved them...but not the price. They aren't big and you need a fair amount to make a statement with them. I then saw some knockoff's here and was inspired to make my own for a fraction of the price. I started with three bags of wooden balls from JoAnn's (of course I used my 40% off coupons). Then I painted them all white (three coats). I picked these letter stamps up at Joann's while I was there. They were on sale for $6.99. While I was busy painting things white, I bought this $1 birdhouse...keep your eyes peeled to see what I end up doing with it. 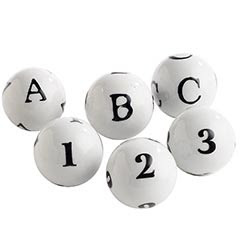 After the balls were dry, I took the stamps and stamped each letter twice on the ball with black ink. I put them inside these Ikea jars for now. Not sure that I love them there yet. I agree. I am trying to find a nice big jar to display them in. I actually have about two dozen more that are just rolling around in a jar that need a home. Can't wait for more garage sales to pick up so I can find something! I like the balls and the jars, but what if you put all the balls in a bigger version of the jars they are in now? I love those candy store jars! I love the balls in the jars, great idea! I bought those IKEA jars a few weeks ago, to set aside for a future project, aren't they great? Fabulous! I bet that took a lot of patience, too. They look great and were worth the time and effort. Hi!! Visiting from Just A Girl..
Those are great! I will have to make some! I am loving the lettered and numbered ball idea. I do like them in the larger jar, but did like the suggestion of adding some solid black (or red!) ones w/ them. Happy Friday Follow! i love that idea- great job! Very cute! You could also, in the beginning of the project, fill the holes in with a dab of wood filler before painting. Love the jars! Michelle, the wood filler idea is brilliant! Those holes drive me nuts! I'm visiting from Friday Follow..and have become a follower. I love the idea of the alphabet balls..they came out great. Hope you come visit and follow me as well. Have a lovely weekend. I too love these balls. So cute!! I am making some right now. I think they are addicting!! I love those small jars you have them in but I think I prefer the balls in that bigger glass container. It shows them off more. Either way, they are awesome! Thanks for sharing at Fun to Craft's Spring has Sprung Party.